Why carbon fiber?Among sports car enthusiasts, carbon fiber wheels are on the short list of dream components for high-performance vehicles. In the rarefied world of supercars only Koenigsegg has offered optional carbon fiber wheels. 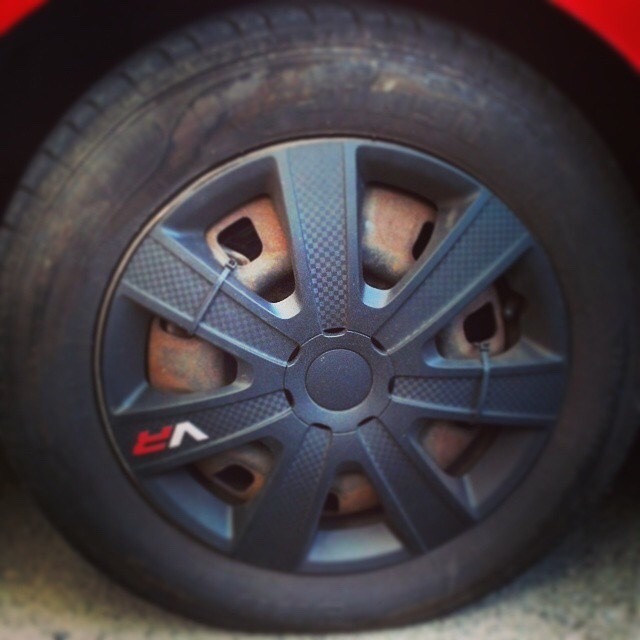 Produced to high standards – tested to ensure qualityManufacturing carbon fiber wheels begins with the creation of the preformed internal carbon structure, composed of precisely manufactured carbon strands arrayed into woven fabrics. The elements are then placed into a mold using state of the art manufacturing techniques. Superior performanceThat the new Ford Shelby GT350R Mustang will be rocketship-fast should come as no surprise, but by cutting the weight of each wheel nearly in half compared to an equivalent aluminum wheel (18 pounds versus 33 pounds), handling and acceleration performance see serious benefits. The wheels also provide a reduction in rotational inertia of more than 40 percent, which positively impacts acceleration and braking performance. The wheels are so light, the springs and MagneRide dampers had to be recalibrated because the suspension can respond considerably faster to road inputs. Naturally aspirated 5.2 liter pumping over 500 high revving hp.....that car makes me randy baby! Can't wait to see one! Finally the car tech is catching up to bicycles. Necessary to change the pads when swapping between the carbon and aluminum wheels? This reminds me of when I put chrome spinning hubcabs on my Accord. They were pretty sweet, but at the end of the day I was still just rolling in an Honda. I have no idea why but I read that entire thing and found it intriguing. Oh yeah, I'm drinking. That explains it. If the $1k per wheel is accurate, I'm shocked they don't cost far more. The only car I know of that has carbon wheels now is the zonda. I tried looking it up the price but Campy makes a ride bike wheel set out of carbon that they named Zonda. Now it's impossible to search. FYI the rx7 wheels on my Galant are lighter than these gt350r carbon wheels. If the car wasn't 4,000lbs it wouldn't need such enormous tires. Saving. I'd love to get a base GT350 in a few years. Yeah, how does a set of carbon fiber MTB wheels cost $1500 and these are $1000 each? The carbon wheels are probably a thousand each upgrade price. Really doubt you'd see them for less than 3k each. I will look tomorrow and see if we have any 2016 data yet. Yeah I was way off. At a mustang G6 board they are estimating ~ 15K for the option. The CF wheels are standard on the R. Base GT350 is $49,990. A loaded GT350R is $67,000. Retail on these wheels are over 6K EACH.